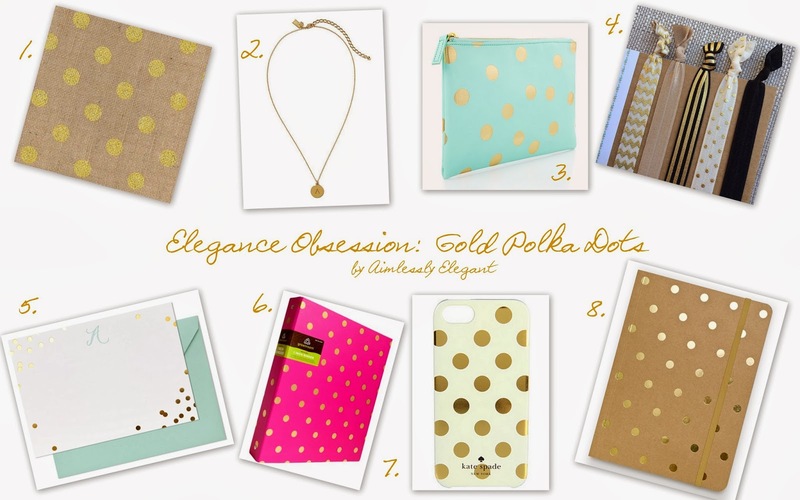 I don't know what it is about gold polka dots, but lately I'm obsessed. I think it is something about the whimsy of the polka dots combined with the elegance of the metallic gold. It makes something that could be taken as childish have a sophisticated feel. It started back in October when I got my 'new' (yes I got it in October and it is still considered new) Kate Spade bag with gold polka dot lining. I'm pretty sure the lining of that bag helped to seal the deal. I love it so much I shared it in my first Friday Five post. I've rounded up a few of my favorite finds, all of which I wouldn't mind adding to my collection. I've been eying the Kate Spade iPhone case since before Christmas and I plan to snag a few of the Target binders for my office (If I can find them in pink, right now my Target only has them in blue and orange so I'll have to look around for them).